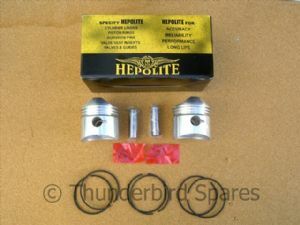 This is a new set of pistons to fit the Triumph T100 models from model years 1967-1974 (for the twin carb head) or from 1968-1973 (for the single carb head). This is the new type fully "hemispherical" head, the earlier head had a squish band and had a smaller hemisphere with a squish band (step) around the gasket face, smaller valves and different pistons. 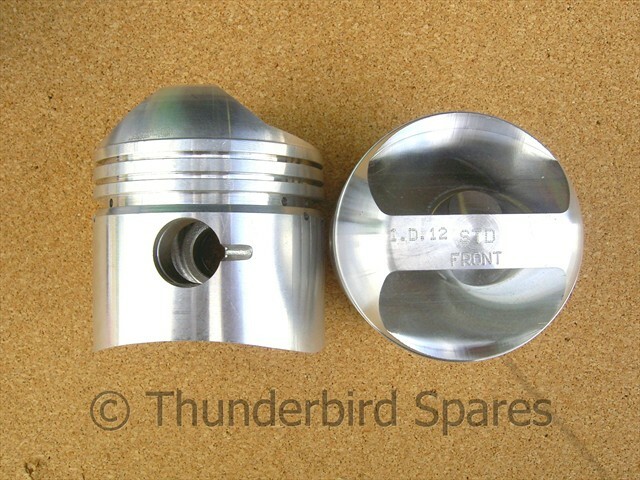 These are STANDARD size, 9:1 compression and are complete sets (two pistons) with rings, gudgeon pins and circlips. Oversizes are usually available, please see our other listings for these. They are the relaunched Hepolite brand supplied by Wassell Ltd in the UK. The rings are made in the USA (by Hastings) the pistons by JCC in Taiwan (OE supplier to Honda, Yamaha, Nissan etc). We have tested them in our own machines and are satisfied that the quality is good. If you are unsure which head type you have please email us.